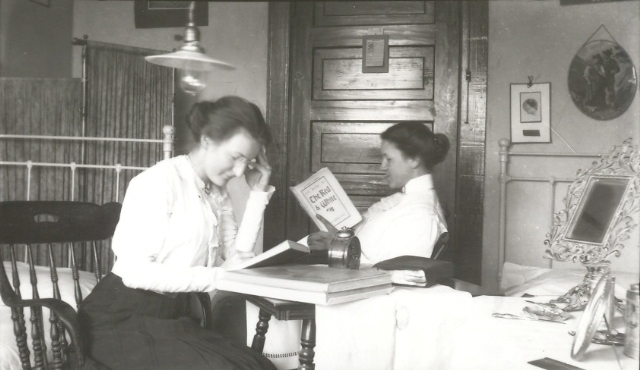 Two Meredith students settle down to study in their dorm room at the original campus in downtown Raleigh. This photograph was made by Lucy Sanders Hood, who studied art at Meredith around 1910. The Bathtub Ring was founded in 1968 by Betty King, Ayn Sullivan, and Peggy Timmerman, all members of the class of 1970. (_The Vision Revisited: A History of Meredith College 1971-1998_ by Carolyn Robinson, p. 59.) Yale wins that one; however, Meredith did have one of the first student government associations in the South, beginning in 1905! Dr. Mary Lynch Johnson writes in detail about this in _A History of Meredith College_, 2nd ed., p. 136-139. Thank you for your comment, NNB. We are so glad to hear that you like them! If you have any suggestions or know of an image that you might like to see, please let us know by emailing us at alumnaeblog@meredith.edu! I love seeing these OLD pictures! What a history we have! Wow!